Tribes Overall: "We had a fantastic time. 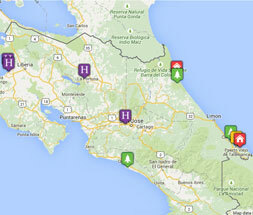 We had high expectations due to other people’s experience of Costa Rica and these were surpassed. We saw more and experienced more than we thought possible and loved the country and it’s people." Tribes Service: "Rory did a wonderful job putting together a varied, ambitious but manageable itinerary for us. Everything worked like clockwork and we felt that we saw the variety of aspects of the country we’d wanted to see. We enjoyed the wildlife spotting and zip lining and tubing adventures. The details were thorough and informative and our itinerary handed to us on arrival was very detailed." Guides: "Without exception our guides were superb. They all spoke good English and sometimes were happy to let me practice my basic Spanish too. They were knowledgeable, great at spotting even the tiniest brown thing in a brown forest a long distance away and were interesting and informative. The drivers were skilful with poor roads and friendly and accommodating. Above all, all of them were totally reliable and punctual." Social & Environmental Responsibility: "It’s hard to comment as apart from your literature we didn’t really have the opportunity to observe the work that was carried out by Tribes. It was very clear that Costa Rica prides itself on it’s eco- awareness and it was apparent that all travel companies, hotels and tourist attractions continued with this ethos." We loved being in the middle of the jungle and hearing howler monkeys at 4.30am! (With the time difference we were awake anyway!). We quickly became friends with the people who joined us at our table for every meal and some of them were on our excursions too. Juan was not only our guide but also like a holiday rep making sure we were in the right place at the right time. He was excellent, although I think we were lucky as some other people didn’t seem to have as good as an experience as we did with other guides. Beautiful view from the vast balcony. It was a great place to relax after the long flight and get our bearings. Loved having the sun loungers on the balcony. The staff were extremely friendly and we were all on first name terms after just 2 nights. I was sorry to leave! Described by a Canadian in our shared transport as ‘swanky’ which was very fitting! The Don Quixote/ baronial theme mixed with vibrant pictures of macaws etc seemed a little odd at first but we got used to it. Due to it’s size, the hotel was quit corporate compared to the others but the staff were friendly and helpful. We had an excellent view from our balcony and saw several birds, monkeys, and a very good close up of a sloth, in fact more than in our visit to the National Park. There are an awful lot of stairs and steps, and the walk down to the beach is steep and rugged. It is situated a little way out of town and a shuttle bus runs during the day but it is a $10 taxi ride each way in th evening, therefore adding to the cost of a meal out quite considerably. Personally this was my favourite hotel. Luckily we were upgraded so we had a spa bath on our balcony and also an uninterrupted view of the volcano and the forest. We could see some monkeys and a sloth. The grounds were beautiful as well. The hotel is obviously on the route of some coach tours and we had large groups arriving daily. However this was never a problem and there was always room for us and in fact we were allocated the best tables in the restaurant overlooking the gardens. The staff were really friendly and helpful. Again a nice hotel with a good friendly feel to it, despite it’s size. There were several warnings about the monkeys, but we didn’t hear or see a single one! We liked the fact that we could walk into town, which we did to eat out as the hotel restaurant seemed expensive. We didn’t have enough time to really explore the grounds as much as we would have liked. "The ultimate highlight was by sheer chance spotting a jaguarundi on the trail by the Lomas de Volcan Hotel, and managing to get a flukey good photograph of it. The hotel staff and other guides we spoke to were amazed at our good fortune. The internal return flight from San Jose to Tortuguero was a great, and in some ways funny experience. We were the only people at the Evergreen Lodge who did this, and everyone we spoke to said they would have done it too, had they known. We came especially to see sloths, and we were lucky enough to have some good sightings, especially from the balcony of our room in the Parador. We really enjoyed the ziplining and the tubing adventure. The scenery was spectacular in places, especially around Arenal. Also we liked meeting people along the way, hotel staff, drivers and guides as well as other tourists in the hotels, on trips or in shared transport. (Some of whom we kept re-meeting at different locations). We all shared tales and photos of our adventures. The most surprising aspect was the relaxed efficiency of every element of the trip. Everyone commented on it. The locals are really friendly and clearly took pride in what they did. "